Syslog is one of those ubiquitous standards on which much of modern computing runs. Built into operating systems such as Linux, it’s also commonplace in networking and IoT devices like IP cameras. 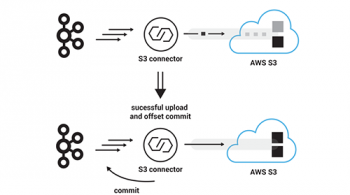 It provides a way for streaming log messages, along with metadata such as the source host, severity of the message, and so on. Sometimes the target is simply a local logfile, but more often it’s a centralized syslog server which in turn may log or process the messages further. As a high-performance, distributed event streaming platform, Apache Kafka® is a great tool for centralized ingestion of syslog data. Since Apache Kafka also persists data and supports native stream processing we don’t need to land it elsewhere before we can utilize the data. You can stream syslog data into Kafka in a variety of ways, including through Kafka Connect for which there is a dedicated syslog plugin. 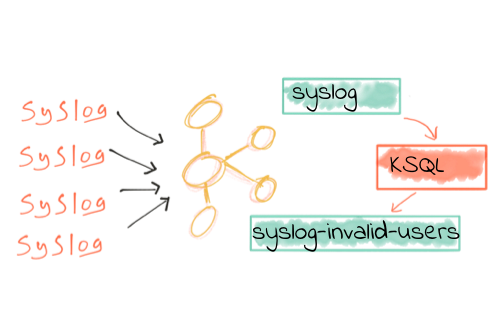 In this post, we’re going to see how KSQL can be used to process syslog messages as they arrive in real time. 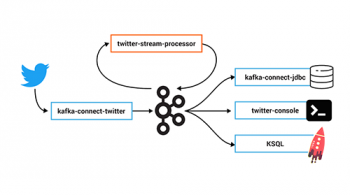 KSQL is the SQL streaming engine for Apache Kafka. Using just SQL, executing interactively or as a deployed application, we can filter, enrich and aggregate streams of data in Kafka. Processed data from KSQL goes back onto Kafka, meaning that we can easily filter and cleanse data arriving in Kafka for use up-stream in multiple applications requiring the same data. Getting started with syslog and stream processing in KSQL is simple. First of all, download and install Confluent Platform. You’ll also need to install and configure the syslog plugin for Kafka Connect, and then configure your syslog sources to send their data to it. How you do this depends on your syslog client implementation—for syslog, see here. If you leave this running you’ll see all new events streaming to the console. Press Ctrl-C to return to the KSQL prompt. 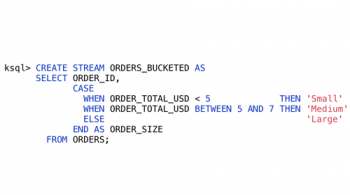 Using standard SQL commands, we can query and manipulate the stream of events. This is a continuous query, and will continue to show new data as it arrives. Press Ctrl-C to cancel and return to the KSQL prompt. I’m going to cut over to some real syslog data now, so that we can explore the potential of what we can do with KSQL. My syslog data is streamed from my home network—a few servers and containers, some network APs, and a bunch of mobile devices. 2018-03-12 13:31:00 | rpi-03 | rpi-03 sshd: reverse mapping checking getaddrinfo for host3.artegix.info [185.55.218.153] failed - POSSIBLE BREAK-IN ATTEMPT! 2018-03-12 13:31:02 | rpi-03 | rpi-03 sshd: reverse mapping checking getaddrinfo for host3.artegix.info [185.55.218.153] failed - POSSIBLE BREAK-IN ATTEMPT! 2018-03-12 13:33:35 | proxmox01 | proxmox01 kernel: [30936072.607801] audit: type=1400 audit(1520861615.501:3062182): apparmor="DENIED" operation="ptrace" profile="docker-default" pid=26854 comm="node" requested_mask="trace" denied_mask="trace" peer="docker-default"
We’re going to see now how we can extract just certain logs of interest—in this case, the login attacks. We’re deliberately not going to try and do this closer to the originator (e.g. by changing the syslog config on the source) because this ‘premature optimisation’ of our data reduces its overall fidelity and prevents us doing other work with it. For example: we still want to retain all our syslog data for long-term storage—perhaps for audit purposes, perhaps for purposes we don’t even know yet—and if we cut down the scope of the data too early we can’t do this. "string": "Invalid user xbmc from 186.249.209.22"
"string": "<38>Nov  9 14:23:19 rpi-03 sshd: Invalid user xbmc from 186.249.209.22"
KSQL gives anyone the power to write stream processing applications, using the simple declarative language of SQL. In this article we’ve seen how we can inspect inbound streams of syslog data and easily create a live stream of filtered messages written to a second Kafka topic. In the next article we’ll take a brief detour from KSQL itself, and look at using Python to write a very simple push-notification system, driven by events arriving in a Kafka topic. We’ll see some simple anomaly detection, building on KSQL’s stateful aggregation capabilities. After that we’ll return to KSQL in force, using its superpowers to join our inbound syslog data with useful data from a datastore that we can use to enrich the syslog data in realtime. I am exploring KSql in my local Mac machine. I just downloaded Zip – Development version of Confluent. I get following error. Could you pls help me provide some suggestion to get rid of this error. Caused by: java.util.concurrent.ExecutionException: org.apache.kafka.common.errors.TimeoutException: Timed out waiting to send the call. Caused by: org.apache.kafka.common.errors.TimeoutException: Timed out waiting to send the call.